Earlier this week, a riot broke out in Foxconn's Chengdu plant. According to reports, up to a thousand Foxconn workers ended up rioting and police were called in to subdue the crowd. Initially, the outburst began in the factory's male worker dormitory. Security guards arrived on the scene to stop a thief, and allegedly, some Foxconn workers with grievances against the security guards, beat them up and drove them out. From there, things escalated. Report stated that up to a thousand workers rioted, throwing chairs, pots, bottles, trash cans and fireworks. The rioters also destroyed public facilities, according to Want China Times. The reason for the riot seems to be pay: Foxconn workers at the Chengdu plant are seeing their hours cut and are given unpaid days off for no reason. Employees are worried that if this continues, they'll be making less than minimum wage in China. The riot was apparently a manifestation of those concerns. The rioting lasted two hours, until outside police were able to suppress the disruption. Want China Times stated that "hundreds" of police appeared to break up the riot, which "up to one thousand workers" participated in. These reporters sometimes overstate—or even understate—the number of participants. Photos of the riot appeared on government press outlet The People's Daily, which stated that a thousand participated. However, the People's Daily story is not in house reporting and says the story was taken from "foreign media". The link is apparently no longer viewable in China. Sources in China tell Kotaku that this riot did happen. What's more, the Chinese government is systematically going through the internet and deleting stories in China that mention the riot. If you write the Chinese for riot (暴动 or "baodong") on Chinese social networking sites, it will be deleted. It's a sensitive term in China. Moreover, in Chengdu's sister city, Chongqing, there have been riots to stop the merging of districts. People are upset with welfare, school taxes, and utilities. 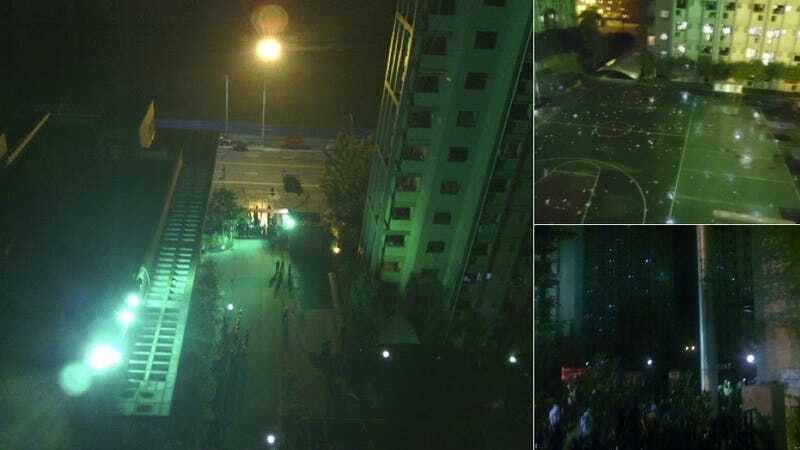 Photos of the event do not show "up to a thousand workers", but according to Chinese social networking sites, people participated by throwing things from their dormitories to the ground. Hundreds of rioters were apparently arrested; however, Chinese language reports state that dozens were arrested. While Foxconn manufactures the Wii, the PS3, and the Xbox 360, the Chengdu plant produces displays for the iPhone. Last spring, an explosion at the Chengdu factory's iPad 2 line injured fifteen workers and killed three.